Here are some themes, symbols and motifs that run through The Great Gatsby. These are just some; I will post some more as we go over the novel during the next two weeks. 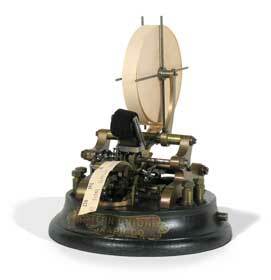 The type of stock ticker Nick would have used to keep track of stocks in 1922. Money: The effects of money on human behavior is a major issue in the novel. As for the theme of money, one could specify many variations: Money creates the illusion of happiness; money corrupts moral behavior; money has a diffuse influence on everything in life, etc. In fact, if you were interested in interpreting and writing something concerning money / materialism in The Great Gatsby, you could look at something in your own life and / or the world around you in which money has some influence or effect, and place it in the context of the novel. One of the “exercises” Fitzgerald engages is the “what if” method of writing popular amongst Naturalist writers of the time. He wonders, what if a young, inexperienced man from the Midwest amassed a great amount of wealth, and moved to metropolitan and cosmopolitan New York to impress and win over the aristocratic boyhood girl of his dreams? We will discuss in the next class the issue of literary Naturalism, the sort of fictional laboratory experiements of human behavior certain authors practiced. This is an age old theme in literature. Illusion / Reality is known as a “dichotomy,” which means two terms that are opposite to each other, but which create an interpretive tension. Literature is filled with dichotomies, and authors use them to create meaning: light / dark; good / evil; war/ peace; male / female; life / death. There are hundreds of them. A very effective way to understand and interpret literature is to locate the different dichotomies, and try to understand why the author is using them. So Fitzgerald uses the dichotomy of Illusion / Reality throughout the entire novel. In context of the issue of MONEY, Fitzgerald shows a world in which wealth creates veils darker human nature. The beautiful mansions hide an ugliness inside. The same holds true for people. Although Jordan Baker is beautiful and outgoing, she reveals herself bit-by-bit to be uncaring and ruthless. Centrally, Daisy Buchanan is beautiful, vivacious, friendly and elegant. She comes across to the reader as being a positive and attractive person. But as the novel progresses, Daisy manifests her carelessness, selfishness and apathy. Finally, at the end of the novel, she not only lets Gatsby take the fall for murder, but flees the east coast with Tom without a return address, so to speak. Jay Gatsby encapsulates the dichotomy of illusion / reality the most. His whole “aristocratic” pose is a front for his criminal operations. His slight British accent is feigned. In the first few chapters of the novel, Gatsby remains a mysterious figure. We only hear snippets of information about him from various people that may or may not be trues, such as: he is friends with the Kaiser; he killed a man once when he was young; he went to Oxford; he inherited piles of money from German descendants. In fact, we never know the complete truth about Gatsby, except for the story of his life he tells both Jordan and, later, Nick, and Myers Wolfsheim’s story of how Gatsby came to the underworld (which may, ironically, be the only truthful story about him). Notice how in many of the “party” scenes, at one moment the party looks glamorous, and the next it looks cruel and tawdry. Pay particular attention to the conversation between Owl Eyes and Nick during the first of Gatsby’s parties that he attends on pp. 49 – 51. In many ways, this short dialog encapsulates the whole theme of illusion in the novel. There are many more examples of illusion / reality, or lies / truth we could look at as we go on. Fitzgerald/ Nick announces fairly outright at the end of the novel that it is about the collapse of the American dream of happiness and individuality. In particular, he exposes the lie that one can use money to transform one’s dreams into reality. Jay Gatsby, in fact, is the last man, according to Fitzgerald / Nick, to attempt to transform his dream into reality with money. Gatsby innocently believed that cleverness, hard work and material fortune would win him the boyhood girl of his dreams. In fact, he does not imagine that it could be anyway different. The notion of “the American Dream” is a big topic in literature and history, and much debated. What is the American dream? How is it fulfilled? Is it financial fortune? Personal accomplishment toward a goal of happiness? A family and a house? Many American novels after Word War I question the nature of the American dream, particularly after the shock of the War, and then very much after the 1929 Crash and during the Great Depression. Fitzgerald also explores point-of-view, what it means to tell a story, and how perspective affect the telling of a story. Nick Carroway is the first person narrator, meaning he tells the story through his point of view. The novel is told in the first person, “I,” and everything we see through his eyes. Therefore, we do not get any of the narrative through any of the other characters points of view. When an author uses the third person–“he” “she”–or the omniscient point of view, he tends to show a story from the perspective of many different characters. Since we see everything through Nick’s eyes, it is important for us to assess his character, and to interpret how he sees things. The unreliable narrator means that, since everything is seen through one person’s eyes, we have to question how much we can trust his perspective, and how this character’s personality and attitude toward the world might affect the way in which he tells the story. So consider Nick’s attitude toward his subject matter, how he feels, what he has to say about the world around him.. And also consider the type of person Nick is. These things will have a big effect upon the meaning of much of the novel, particularly at the moral climax when the reader is forced to assess how he/she feels when Nick exclaims to Gatsby near the end (the last words he says to him before he is shot): “They’re a rotten crowd. You’re worth the whole damn bunch put together.” On page 162.